While visiting Megan's parents in Maine last month, I wanted to make sure I make the arduous 1 mile trek (Ok, i'm kidding) down the highway to the Crooked River. In the past, I had seen many interesting dragonflies there. Rivers often harbor species completely different from bogs and ponds, and the Crooked did not dissapoint. I had a wonderful time stalking and photographing the tiny Eastern Least Clubtail- from head to the tip of its abdomen, no longer than an inch and a half. 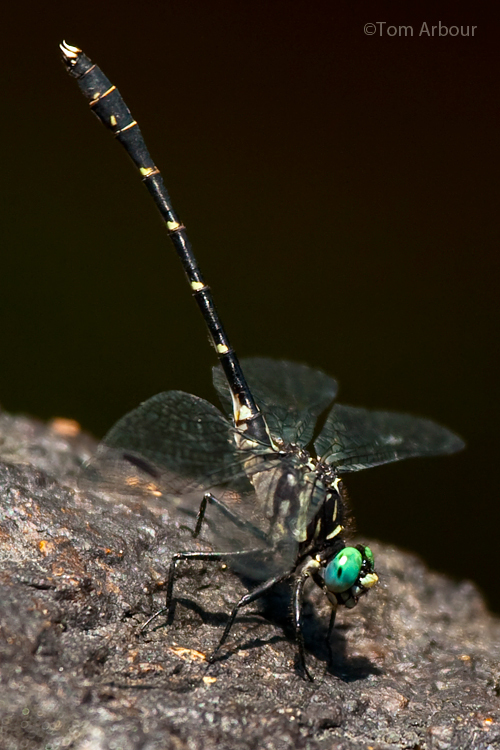 These clubtails are known from Ohio too- but I've never seen them. Rocky streams seem to be a good place to find them, and Rosche, Semroc, and Gilbert say they can be seen on the Grand River and Conneaut Creek in northeast Ohio. The color of it's eyes are amazing ..very nice!! Grammie- We love Maine, it's a wonderful place! Love the bright green eyes - great photo!